“The Church in Vietnam, an older sister of the Church in Asia” from November 24, 2018 to June 29, 2019. 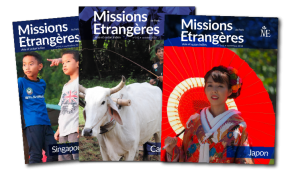 MEP magazine is a monthly publication in French dedicated to news about MEP and Churches in Asia and Indian Ocean. Discover these regions of the world through extensive articles on the political, economic, religious and cultural news of these countries. Receive the latest news flashes of the MEP (Paris Foreign Missions) news agency by subscribing to the newsletter. France has a great missionary tradition. During the first half of the 20th century, half of the foreign missionaries in the world came from the Church of France. For over 360 years now, over 4,000 French priests have been sent on mission by MEP. Eglises d’Asie (EDA) is MEP’s news agency. It is comprised of a team of lay journalists and religious people specialized in religious matters in Asia. MEP Archives (AMEP) service is dedicated to collecting, classifying, conserving, communicating and valorization of MEP archives.